When you stay at Happy Star Club in Belgrade, you'll be connected to the airport and close to Red Star Stadium and Cathedral of Saint Sava. 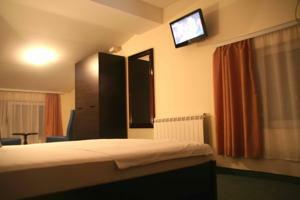 This casino hotel is within close proximity of Partizan Stadium and National Library of Serbia. Make yourself at home in one of the 17 air-conditioned rooms featuring fireplaces and LCD televisions. Complimentary wireless Internet access keeps you connected, and cable programming is available for your entertainment. Conveniences include phones, as well as safes and desks. Take advantage of recreation opportunities such as a casino, or other amenities including complimentary wireless Internet access and a hair salon. Enjoy a meal at a restaurant or in one of the hotel's 2 coffee shops/cafés. Quench your thirst with your favorite drink at a bar/lounge. A complimentary buffet breakfast is served daily.